These are among the lies regularly hurled by “lunatic fringe” Right-wingers—and, more importantly, “mainstream” Republicans. Many liberals—such as those who regularly take to Facebook—believe Right-wingers simply lack correct information. they would be telling the truth. There are two motives behind such blatant lying—and mere ignorance is not one of them. Motive #1: Right-wingers don’t want to admit the truth about events most people instinctively believe are evil. Right-wingers intuitively know that shoving huge numbers of naked men, women and children into gas chambers is the arch-example of evil. And so is spraying scores of bullets into scores of helpless men, women and children in churches, nightclubs and schools. They know they can’t convince decent people that such atrocities are really acts of humanity. So it’s easier (for them) to simply deny that they actually happened. The tobacco industry paved the way for such arguments. The Tobacco Institute—a trade association created in 1958 to pose as a “smoking research” center—cast doubt on scientific studies linking smoking with lung cancer, emphysema and heart disease. And, for the Tobacco Institute, there could never be enough studies to prove that smoking was a thoroughly deadly habit—that reaped billions of dollars every year for the tobacco industry. Motive #2: Right-wingers claim Right-wing atrocities didn’t happen to put the victims of such atrocities on the defensive. This, too, was a major aim of the tobacco industry. By constantly demanding “Prove to us that smoking is deadly” and then arrogantly dismissing all evidence put forward, tobacco executives put the onus on their opponents. Thus, after the MAGAbomber was arrested and his van was found plastered with pro-Trump stickers, Right-wingers reflexively seized on a series of lies to “cleanse” themselves. Totally ignored was the truth that Cesar Sayoc had mailed pipe-bombs to 10 prominent Democrats—including two former Presidents and a former First Lady. 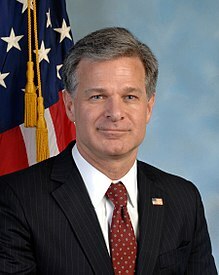 So how did Right-wingers react to Wray’s no-nonsense rebuttal of Right-wing conspiracy lies? They attacked the FBI as part of the “deep state” determined to thwart and, if possible, impeach Donald Trump. According to one Rightist theory: The FBI made the bombs and sent them out to implicate some poor Trump supporter—if not the President himself. Fortunately, there is at least a partial solution to such lies: Lawsuits based on the truth. Jones hosts The Alex Jones Show from Austin, Texas. He had claimed the mass shooting was fake. Jones has also accused the U.S. government of faking the 1969 moon landing footage and planning the Oklahoma City bombing and the September 11 attacks. Thus, a reasonable person would understand that Jones meant the massacre was staged and the deaths were fabricated. So how did Jones respond to the lawsuit?